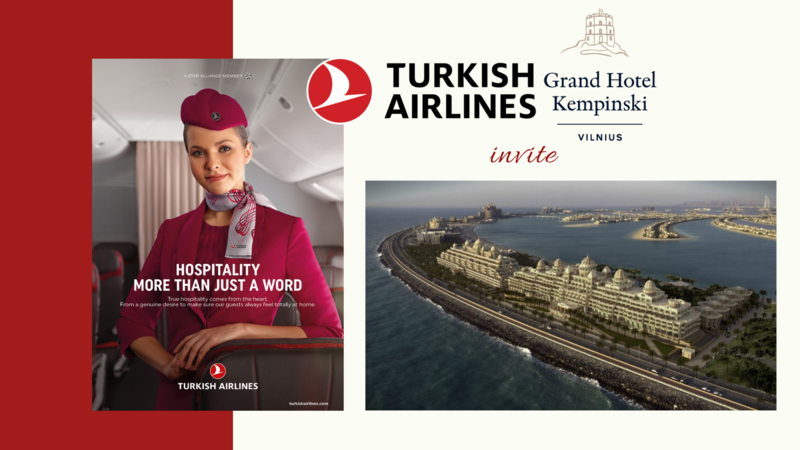 The BCCL is proud to invite its Members to enjoy the evening with Turkish Airlines at Grand Hotel Kempinski Vilnius! During the event – the representative from Turkish Airlines Sigita Morkūnienė (Sales Manager, Lithuania) will tell you all the news and updates about Turkish Airlines, more about the special programme for companies and, of course, the new Istanbul Airport to which Turkish Airlines has moved 06APR (and the first flight from Vilnius was this month!). Turkish Airlines – Turkey’s “rising star”, that started its journey in 1933 with just five aircraft. Today it serves with a passenger and cargo fleet of 335 aircraft and with the same excitement and enthusiasm as the first day after all those years. The Grand Hotel Kempinski Vilnius Representative Birutė Leimontaitė (Director of Sales and Marketing) will tell us more about the brand new 5 Star Luxury Resort in Dubai – Emerald Palace Kempinski Dubai! Followed by networking and a glass of wine. to kristina@bccl.lt by April 17th.